Discover the secrets of "SoLoMo" marketing, both online and off. 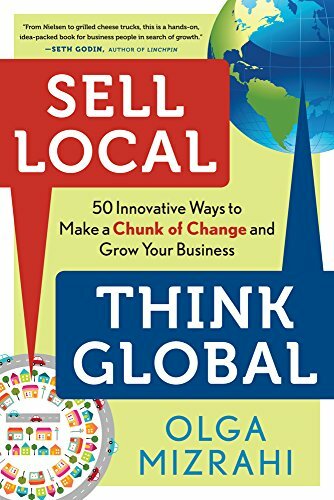 "Sell Local, Think Global is a must-read in today's business environment." "Have too much on your plate? Not sure how to compete? In 50 fascinating bite-sized tips, Sell Local, Think Global will have you completely reevaluating the way in which you market your business and sell yourself. I've seen Olga Mizrahi speak to hundreds of business owners, who were then ready to transform themselves into big, colorful fish in a surprisingly small pond." "We work with hundreds of marketing strategists nationwide, and Olga Mizrahi is the best of the best. Our revenues are up 40% in the two years that we've executed on Olga's techniques, which shot our prior single-digit growth statistics through the roof! From one business owner to another: if you want to grow your business, buy Sell Local, Think Global today."